Many of our competitors offer fairly long analysis reports, and some even offer 1-hour (or more) videos. In contrast, I write my analysis updates in a short and distilled fashion, and I do not offer any long videos here in my GEWC analysis service. “Why are you not offering long updates? Isn’t longer better?”, you may ask. No. Long analyses are the hallmark of an insecure and incompetent analyst. Lenghty analysis reports are often the hallmark of insecurity & incompetence. Earlier in my career when I was still an amateur, I used to write fairly long reports to my clients, and I was often awake until 03:00 or sometimes 04:00 when I felt I couldn’t get a grip on the market. In hindsight, I can say that those were the practice years. I was unknowingly incompetent, and had to put in the long hard hours to make things work properly. I don’t regret it. But these days it’s different for me. Today I know, that if I don’t know what the market is doing, there is noone out there who knows more than I do. In other words, I’m very secure and self-assured of my competence. This doesn’t mean I get everything right. But I have closed out 48 winning trades in a row at the time of this writing, counting from my latest winning streak which started last year, and I’m rarely completely off track in any market (please visit the Results section if you don’t believe me). And my analyses are shorter. If someone can’t distill their entire knowledge into a few paragraphs, then they are still amateurs. Besides – think about the immense amount of articles and news you are bombarded with every day. Many people are simply suffering from what we may call “information overload”. You need a professional like me to provide you with my opinion in a relatively short and distilled fashion. Don’t let fluff waste your time. You may feel you get more value from a long-winded analysis report – but you won’t. You’ll simply lose more time. As for these Technical Analysis videos everyone puts out these days? Well – they are a useless waste of time. Do you have an entire hour or more to watch a video with often murky clarity, where someone gives you his/her opinion which might then be annihilated by the market on the next open? Don’t confuse long analysis reports or analysis videos for “value”. There’s an almost inverse correlation between how many words someone needs to put out to make their case, and the actual value of said words. Long-winded analysis content can still be destroyed in an instant. The financial markets don’t care that your favourite analyst put out a long report about why this or that should or should not happen. In fact – the financial markets can totally wreck a 200-page amateur analyst’s report in almost an instant. At the same time, it can validate a concise summary written by a professional (such as myself). But there’s an even more subtle danger of long and detailed analysis reports: Nothing in the financial markets can every be guaranteed. But by reading long reports with countless of arguments for why X should happen, you may gain a false sense of confidence and do something dangerous, which might even incur a career-ending loss. Most of our competitors create unnecessary content with low value to justify their asking price. Lastly, a lot of the useless fluff, including long-winded videos and similar time destroyers, are simply created so that our competitors can justify their very high asking price. You need to ask yourself if you are better served by an expensive subscription with a lot of content, compared to – for instance – my qualitatively superior and relatively short analyses. 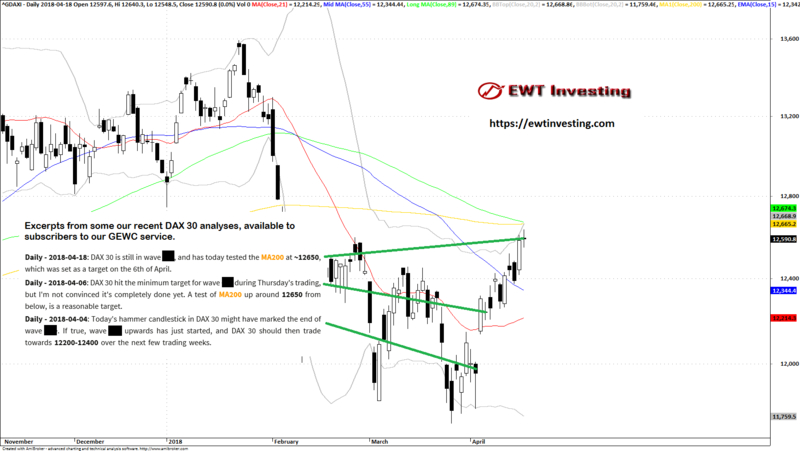 Two recent examples of brief and accurate analyses: DAX 30 (Germany) and S&P 500 (USA). Let me back up my assertions by presenting two relatively recent examples of high-profile markets, in which a series of short and concise analyses written by me, did the job extremely well (without draining my subscribers of their mental energy unnecessarily). As is evident, I called the recent advance in DAX 30 very well. The analysis updates are short and brief (though some were slightly – but not much – longer than what I present in the excerpt above). 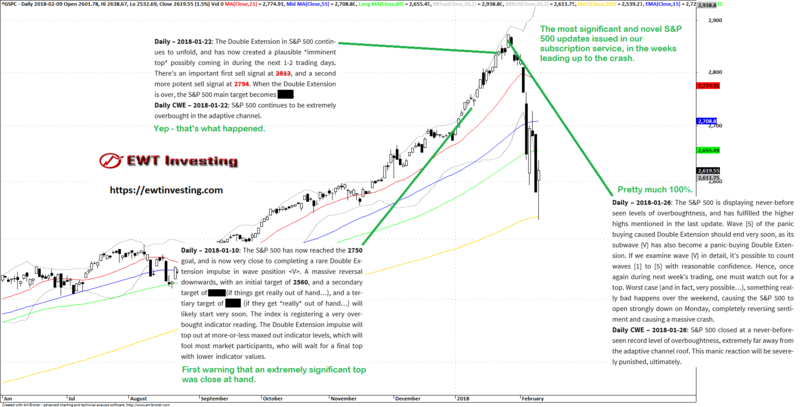 As is evident from the picture above, this series of updates on the S&P 500 before the top was hit, were longer than the recent series of commentary on DAX 30, presented in the previous example. Still – it’s just several paragraphs of relatively concise content. And it ended up being a very good series of analyses too! The solution is to subscribe to a professional service. The analyses are (mostly) not particularly long nor hard to grasp. That’s because they’re made by competent people. Our concise reports will hopefully not goad you into dangerous risktaking by presenting too many arguments. There’s no useless fluff content which wastes your time just to create a false sense of “value”. There’s no useless fluff content which is only added to try and justify a higher price. Our prices are – for now and at the time of writing this article – very reasonable for what you get. Lastly, you may feel that I sound arrogant or harsh. But the reality of trading is that it is a “minus sum” game. You have to pay comissions for trading, account fees, data feed fees, analysis service fees, maybe office rent, computer equipment, etcetera. Then you also have to regularly defeat other traders in order to finally be profitable. I may sound harsh because I deal with the reality of trading – this article is not intended to make friends, but it does provide you with considerable value nonetheless.